We were interested in studying thiamine pyrophosphate (TPP, coenzyme B1) and adenosyl cobalamine (coenzyme B12) binding riboswitches (in collaboration with Professor Alison Smith, Dr. Finian Leeper and Professor Martin Warren (Kent)). We have developed methods, using biophysical techniques (equilibrium dialysis, ITC and NMR) to test small molecules (including fragments and ligand analogues) for binding to riboswitches. 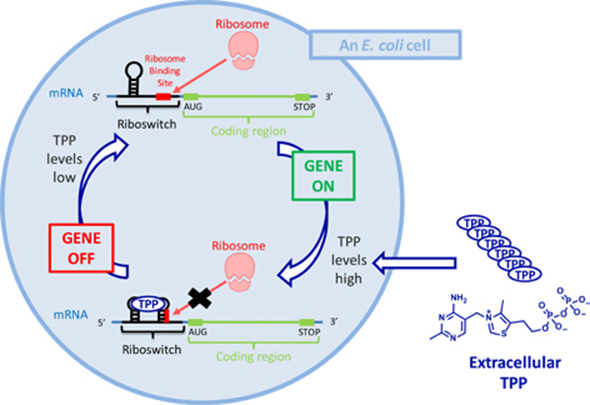 We identified fragments with high ligand efficiencies and thiamine analogues with high binding affinity for the E. coli TPP thiM riboswitch, and have carried out structural studies on these systems in collaboration with Professor Adrian Ferre-D'Amare (National Institute of Health, USA). Validating fragment-based drug discovery for biological RNAs: lead fragments bind and remodel the TPP riboswitch specifically.